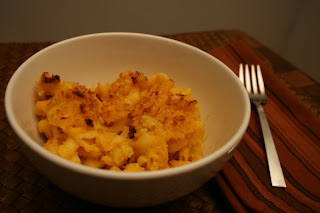 It isn't as creamy as traditional mac and cheese is, with a thicker texture to the sauce, more like the thickness of a baked pasta with a tomato sauce, but it's still cheesy, with a strong mustard flavor. It's a good dish, but I know it definitely could be better, but I've mostly stuck with the recipe with just a few extremely minor diversions. Bring a large pot of water to a boil. 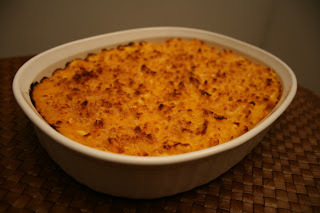 Cook macaroni until not quite al dente, about 4-6 minutes. Drain and transfer to a colander or bowl. Meanwhile, place the frozen squash and milk into a large saucepan and cook over low heat, stirring occasionally, breaking up squash, until squash is defrosted. Turn the heat up to medium and cook until the mixture is almost simmering, stirring occasionally. Remove the pan from heat and stir in the Cheddar, jack, ricotta, salt, mustard, and cayenne pepper. Mix pasta into cheese mixture and stir to combine. Transfer into a shallow 1 1/2 quart baking dish. Combine bread crumbs, Parmesan cheese and oil in a small bowl. Sprinkle over macaroni and cheese. Bake for 20 minutes, then broil for 2-4 minutes to brown top.